Hey ya'll and happy Wednesday! Having Monday off was so nice and it definitely doesn't feel like we're half-way through the week already. Andi and I spent our weekend at the Bay and it was lovely just getting away and having a change of scenery. It was cold and rainy but still lovely being by the water. We had some great seafood and did a lot of shopping! 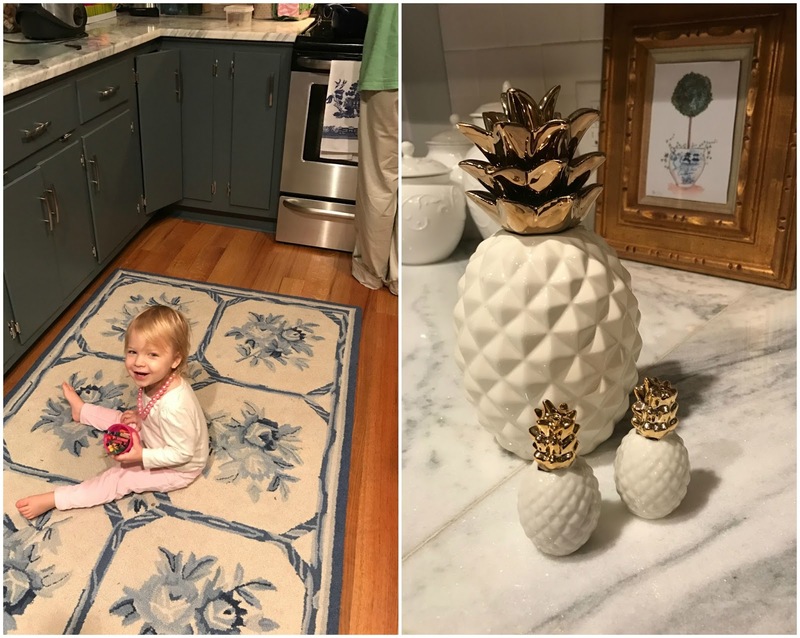 I scored a super cute (and semi-large) blue and white rug for our kitchen, fabulous white ceramic and gold pineapple salt and pepper shakers and picked out a potential fabric for that awesome wing-back chair we scored back in the Fall. The pineapple shakers ended up matching the large pineapple I already have in one of my kitchen display cabinets! The rug was only 12 bucks and needs a little cleaning but I fell in love with the colors. I'm not sure it will stay in the kitchen because I almost feel like I need a round one in that space so let me know what ya'll think. I also want to express my joy for something in our personal life as well. My heart is so full with our new church family! I've gotten hubby on board and Andi also loves it. I wrote it earlier but we decided to go back to the church I grew up in. It felt right the minute we walked through the doors and I've never been surrounded by such accepting and wonderful folks! Many of them, being charter members, I've known since I was 12 years old. We've met a fabulous new couple with 4 boys and another couple with 3 children and I'm so happy to be surrounding ourselves with such awesome couples and faith-based people.Ah it feels so good ya'll! They also decided to start a new bible study for the women in the church starting next Wednesday so I'm interested in seeing how that goes. Thanks for your continued support and prayers through this process! If you've made it this far through my random life update then thank you! 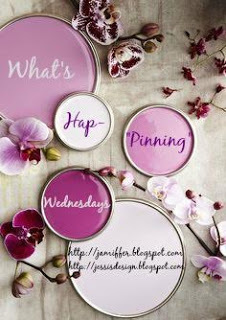 Grab our button and link up with either Jenn or me below to join in on What's Hap-'pinning' Wednesday! I love that rug so much!!!! It would go perfectly in my house ;) haha! That's so awesome that you had such a great weekend! Sometimes a church family is truly all you need! Every time I need some spiritual pick-me-ups, church is just the ticket. But seriously - those gold and white pineapples are gorgeous! Sounds like such a fun weekend with A! I love that rug, I think it fits the space great! 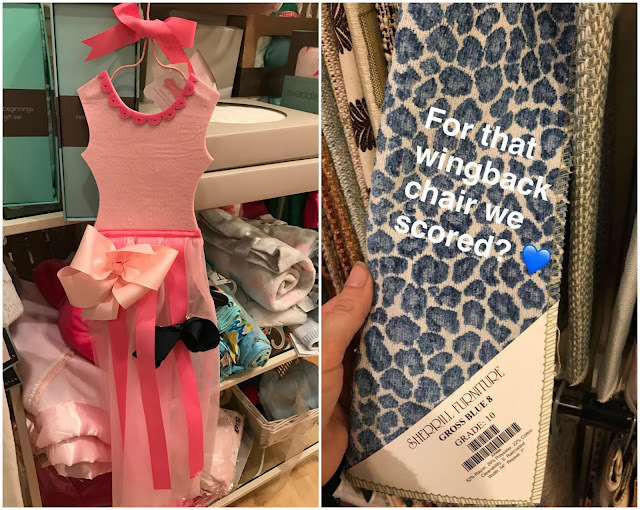 And what a cute party theme, I cannot wait to read more about it!! I'm glad work is going well! 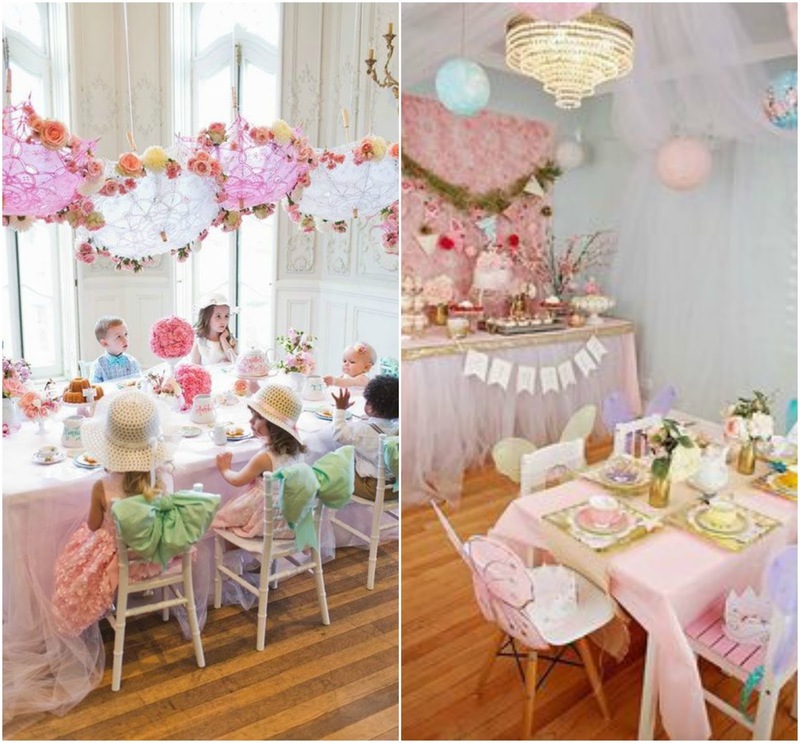 Oooh what a cute birthday party theme! How is she almost 2 already?! Love the scores you found shopping last weekend! And yay for the official church family! Michael and I always talk about how we can't wait to be more involved in a church when we someday find our new "hometown"! Also, so happy the new job is working out!! Girl, those pineapples!! So cute! I can't wait to see what you do with Tea for Two! It's going to be so cute! Love all your finds! The birthday theme is so adorable! That is so awesome you found an amazing church family! It really is the best! Hi, I just stumbled on your blog and love it :) I really like those pineapples by the way. Happy Thursday! So glad you are settling into your new job! I obviously love working in higher ed. Finding a church home (or going back to the original one) is such a blessing. We have been slacking this year on our church time and need to get back on track.